I’ve heard it said that in more advanced stages of psychological development, we come to accept and embrace our masculine self (for women) or our feminine self (for men); what Jung called the Anima and Animus. Lots has been written about it, including this guy’s blog post that I happen to really enjoy. But for me, I’m thinking that understanding what is typically a masculine trait–beer courage–could be part of this advanced stage of development. Prying up old tile in my upstairs bath did not prove as satisfying as ripping out my old bathroom cabinet. What I thought was about a three hour job turned in to a painfully slow process, with me trying (once again) to save something that didn’t want or need to be saved–the poured mud floor underneath–and yellow floor tile mocking me, asking who exactly I thought I was trying to renovate my own house, all the while the voice of my mother asking why I didn’t have a new man to do that for me, reverberating in my ears. I rarely buy beer, but something about doing home repairs makes it seem right. At one point I thought it would be a good idea for hardware stores to sell it. While I doubt that anyone thinks using power tools and alcohol together is a good idea, I do think the idea of having a beer while tearing out a bathroom is a good one. 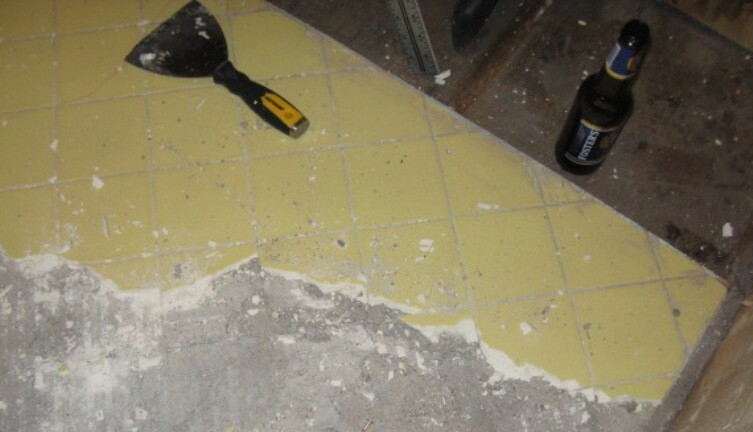 So I opened a beer and started chipping tile from the bathroom floor. An hour later, I’m feeling buzzed and only about four pieces of tile are up. The hammer keeps slipping and I’ve hit my thumb about 45 times. Beer courage fades quickly when you’re met with a smack down. Guys in bars, I get it now. On my mind part of the time was a guy-friend whom I’d had a teeny-weeny disagreement with and who had run for the hills when my voice got all high and whiny like it tends to do when I’m upset. I think if men fully embraced their feminine sides, our getting upset might not scare them so much. But like my therapist used to say, “When a man hears that, all they see in their minds is a giant flashing red light that says ‘MOM . . . .MOM . . . MOM. . .’ and they run away in fear. I wanted him to forgive me long enough to tell him that I’m not his mom, but I hadn’t heard even the slightest hint that would be possible. In yoga class, we are taught to lie with our butts against the wall and our feet up in the air and lay like a giant L to clear our minds. So I did this for a few minutes and waited for the sound of forgiveness, but it never came. I was also hoping if I lay there long enough when I opened my eyes all the tile would be gone and a new floor would be there in its place, but that didn’t happen either. It was pretty awful. I don’t know if men who write novels or are CPAs feel this way, but I think they must. Because they all say this stuff, right? I think I learned something else about men, too. A lot of them are more sensitive than we give them credit for, like my friend who won’t forgive me. They are just as wounded and imperfect as women are. I considered emailing him until he finally gave up and wrote back, but I won’t because I probably did sound like his mom that day, and I know what my brothers think about that.